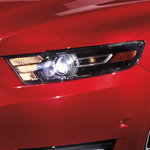 How can the Ford Taurus be considered a widely popular full-size sedan each year? Maybe it has something to do with a few of these technology features. Once you set the Adaptive Cruise Control system in the new Ford Taurus, watch what happens after you get rolling. Any time the cruise control system scans a car moving too slow in front of you, the system slows down the car automatically until clear, then will get the car back up to the desired speed again. Another impressive technology feature in the Taurus is the Lane-Keeping System. Regardless why you drifted out of your lane, the steering wheel in the Taurus vibrates to give you the opportunity to take corrective action. This can help keep you safe on any road or highway you travel. Take a drive to Serramonte Ford and get behind the wheel of the Taurus for a test drive today.